Packaging system manufacturer, Sealed Air will be launching its new vacuum packaging solution – Simple Steps® Gourmet Plates – at Melbourne’s foodpro 2014, Australasia’s largest food processing exhibition. Simple Steps® technology offers food manufacturers smart and superior packaging solutions that will save time and money while maintaining high standards for food safety, quality and consistency. 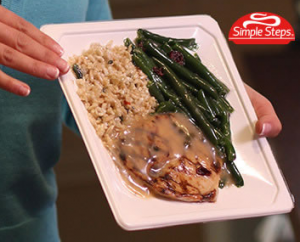 Thanks to its form-fitting vacuum seal, Simple Steps® provides a gourmet presentation unique to the ready meals category. In addition to enhanced freshness over traditional case ready meals, this “total seal vacuum pack” allows Simple Steps® to be displayed horizontally or vertically at retail. Paul Maguire, a representative of Sealed Air, said that the innovative packaging solution would appeal to established retail and foodservice operations. “New opportunities are presented within existing retail or foodservice environments for meal distribution and in brand building with the use of food vending machines at school campuses or chilled ready meals sections at retail,” Mr Maguire said. “With gourmet plated presentation, this allows for direct serving – as if a chef had just prepared it,” he said. Simple Steps® maintains crucial moisture and allows the dishes flavours to come to life. Simple Steps® film inflates to form a steam-filled dome, providing 1.5 times more steam than traditional tray/lid formats. This steam-assisted technology helps ensure the heat is distributed evenly to ensure a perfect cook. Simple Steps® self-venting feature frees the user of having to stir or make pack incisions, eliminating microwave splatters and the risk of cuts and burns. Sealed Air staff will be available at foodpro 2014 to talk with customers about how their range of technologies can ensure quality solutions (stand P30).